Let’s see if I can answer some of your questions here. This is what every one wants to know – right? But the cost of a website varies depending on varying factors, just like the cost of a house or car will vary. I always ask prospective clients about budget up front as this will allow me to guide you in what you can expect for your investment. In general, most of my websites start at $4,000 and go up in price based on a few factors: complexity, scope and timeline. Projects that begin with in-depth discovery, strategy, and SEO plan, generally start in the $8,000 range. A larger corporate site that requires all of that and more can start at about $14,000. We’ll discuss your project and create a custom quote based on your needs. Complexity also applies to strategy – a design may look “simple” may actually have a complex sales funnel and costs more than a site with no sales funnel. The scope of work affects the overall price. The price quoted at the beginning of the project may not be the final price as changes to the scope of work (adding, removing or changing features) may result in the final project cost changing. The time it takes to produce a website depends on the size and complexity of your site and the quality of content that you have ready to go. As a guide, most sites take around 6-8 weeks from beginning to end. Please note that e-commerce and membership sites take longer to develop, please add 2-4 weeks to the timeline if we’re making an e-commerce or membership site together. I’m not very tech-friendly, can you help me so I can understand all of this? One of my specialties is helping my clients better understand the process of owning your own website and how it all breaks down. I love educating my clients! Yes, and this is something you really need to keep your site secure so your investment is always protected. You can learn about my Site Care plans here. Do you offer web hosting plans? Yes! I offer premium web hosting services as part my Site Care Plans. Yes. Initially I want interested parties to fill out my worksheet so we can schedule a call and have it be productive for both of us. When working with clients I do try to schedule all my calls/video chats. This way I can be prepared for your call, have any files open I need and we can have a productive call. Scheduled calls keep my work from being interrupted and allows me to focus on your project and meet your deadline! All the websites I design/develop are built “responsive” so they display correctly across desktops, laptops, tablets and smartphones. I sure do! I use WooCommerce for this because it’s the top ecommerce plugin for WordPress and is well supported. Can you train me to make changes to my website myself? Yes! Not only do I give a personal lesson to my clients on how to update their website content, all my Site Care clients have a library of short video tutorials installed in the administrative area of their website to walk you through any task on your site. I even create custom videos that you may need for specific plugins. I sure can. As part of your project we can include social media services. Keep in mind that good SEO is about waaaay more than sprinkling a few keywords on a web page. While we can’t give away all of our trade secrets here, rest assured that we stay atop of industry trends (including Google’s always-changing search and rankings algorithm) to make sure our clients will rise to and stay on top of search engine results. Our strategy includes extensive keyword research, analysis of your competitors’ websites, rewriting and updating content, creating quality inbound links and much, much more. Yes. For many years I worked with web development multiple platforms. Quite frankly it was too much too keep up with. WordPress now powers about 30% of ALL websites on the planet. 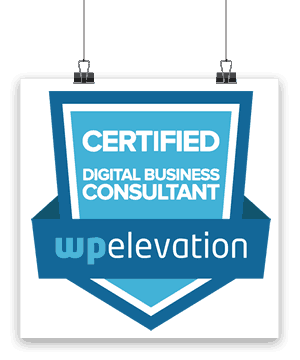 It just made sense for my business and my clients to focus solely on WordPress design and development. I also only design on the Genesis Framework. It’s the most secure design framework for WordPress, and I believe the best for my clients. I have several copywriters I work with so yes, I can provide that service. But it’s not included in the basic web design costs. The client is in charge of delivering content or agreeing to a content package as all web content is due prior to me beginning your project. Yes! I’m happy to help you with a logo or an overall branding strategy. Do you do business with clients outside of the United States? No, at this time we only serve clients in all 50 states in the United States.